The Got Ears?® Personal Isolation System™ is the only system specifically designed to provide complete isolation from just about any noise that is bothering you, whether you are trying to sleep with snoring, concentrate on work in your noisy office, at home with noisy kids or neighbors, out in your backyard next to a highway, traveling on a plane, trying to sleep in a hotel room, or trying to study or sleep in your dorm room. WARNING: Do not use any more masking sound volume than you need to drown out the irritating noise. As with any tool, if the tool is sharp enough to do the job, it is also sharp enough to do you harm, so be careful. Exposure to too much sound for too long a time can permanently damage your hearing. If you are unsure how much sound is safe, choose the PlugFones Protector high noise earphones with built in volume limiter. These volume limiting earphones can prevent unintentionally overdosing on sound. In addition, the Personal Isolation System can prevent you from hearing alarms, crying babies, cries for help from your children, and other sounds you need to hear to be safe. Before using the Personal Isolation System, test to make sure you will be able to hear what you need to hear. Got Ears?® Personal Isolation System™ consists of three components: a white noise source, a headphone extension cable and a set of in-ear isolation earphones. 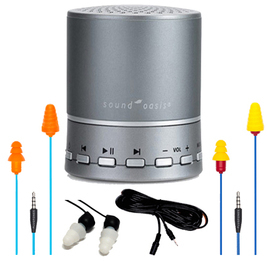 The foundation of the Got Ears?® Personal Isolation System™ is the Sound Oasis BST-100 portable bluetooth enabled white noise machine. The BST-100 is small enough to put in your pocket, on a nightstand in your bedroom, or the corner of your desk, but capable of delivering 10 different built-in high fidelity sounds from which to choose, plus the BST-100 accepts a micro SD card to let you add many more sounds, and it will even link up to your smart phone via BlueTooth to open the door to virtually the entire world of downloadable music and sounds letting you choose practically any sound you could ever wish for to block out the noises you wish would just go away. PlugFones Guardian model isolation earphones are one of the least expensive isolation earphones available. These innovative earphones feature interchangeable foam and triple flange silicone ear tips that block ambient noise at a very good NRR 26 rating. With these earphones in place, you will barely be able to hear a person speaking in a normal voice as close to you as the next cubicle over. When sleeping with a snorer, you will be able to hear just a whisper of normal snoring noises. Then, when you add your favorite masking sound by plugging into your BST-100 white noise machine, what little noise was still audible, will completely disappear, letting you concentrate on your work or finally get the deep and refreshing sleep you crave. PlugFones Protector model isolation earphones work just like the Guardian model, but with the additional safety feature of a built in volume limiter. Protector earphones cannot deliver more than 82 dB of sound, the maximum safe level for continuous listening. No matter how loud you turn up the volume on your BST-100, Contractor VL will prevent the volume you hear from exceeding 82 dB, which makes them the safest choice for long term listening to a constant masking sound. In most situations, you will need far less than 82 dB of masking sound to do the job, so it is unlikely that you will ever exceed a safe level of masking sound, but if you have any concern about the potential for hearing damage from long term use of your Got Ears?® Personal Isolation System™, choose the PlugFones Protector isolation earphones. MicroBuds isolation earphones are the smallest isolation earphones you can buy. These tiny little earphones are small enough that most people can even lie on them while you sleep, and in the ear, they are barely noticeable. Finally, we provide a choice of earphone extension cords so you can still enjoy the freedom to move around in your office or cubicle while wearing your earphones and enjoying your personal isolation from the noises that surround you. Who needs a Got Ears?® Personal Isolation System™? Office workers who are distracted or bothered by nearby conversations. Plug in your isolation earphones, turn on the masking sound you like best and you can instantly solve the problem of all that yacking. Finally, you can concentrate and get your work done. College students trying to do homework (or sleep!) in a noisy dorm room. With your Got Ears?® Personal Isolation System™, you can block the noise that never seems to cease in the dorm or apartment building, and choose your favorite masking sound, whether it be the sound of a mountain stream or your favorite tunes delivered by bluetooth to your BST-100. Anyone trying to sleep in a noisy bedroom, whether due to noise from the street or the apartment next door, and especially when the love of your life is snoring like a freight train. We hear every day from suffering spouses who find that ordinary ear plugs just will not cut it when trying to sleep with loud snoring. Finally, you can get the sleep you need by using your Got Ears?® Personal Isolation System™. Anyone suffering from tinnitus, hyperacusis or ANS (acute noise sensitivity). By using your Got Ears?® Personal Isolation System™ you can mask painful sounds and tinnitus sounds, and even help to condition your mind to become less sensitive to loud noises, improving your ability to cope with our increasingly noisy world. The Got Ears?® Personal Isolation System™ can be a useful tool in applying the principles of TRT (Tinnitus Retraining Therapy). TIP: The Personal Isolation System we offer is made up of quality components at reduced prices so whichever components you choose, your system will be a great value. However, if you are a little short on funds, you can make your own system by downloading a white noise app for your smart phone and plugging in a set of isolation earphones to play your favorite masking sound. Got Ears?® Personal Isolation System™1SamJune 23, 2016I really wanted this to work. It doesn't for me. The earphones are uncomfortable (using either tip) and do not block out any noise. That means you're left with just turning up the volumn to block out the annoying sound. It simply didn't work. Others may have a better experience but this was a lot of money with no result. Got Ears?® Personal Isolation System™5RogerApril 17, 2016It is very small and portable, it has a very powerful speaker and works very well. I have ringing in my left ear, I plug in the ear phone and usually just put it in my left ear on the lowest setting. I'll generally wake up sometime in the night and I'll reach over and just shut it off. It helps me get to sleep faster. Battery lasts a pretty good while, not sure exactly how long, but I was surprised how long before I had to charge it. Overall, very good product and am happy with purchase. Got Ears?® Personal Isolation System™4Charles StoneAugust 10, 2015My wife snores. I have used several sound machines and like this one best of all. It is small, compact and has many different sounds, including my favorite White Noise. The only reason I don't give it 5 stars is 1. each sound ends after 8 hours - no looping is available 2. the a/c connector broke after a few days use. A new unit was sent to me so service rates 5-stars.